Association V.O.S.A Theatre (Open occasional association of alternative mans) consists of professional actors and musicians who have many years experience in the operation of so-called independent, alternative theater, both street, so designated in special non-theatrical venues. V.O.S.A Theatre association shall meet in particular the implementation of interesting prestigious international projects, which always creates a unique presentation tailored to the event. In recent years we have created such pageant performances representing the city of Prague to celebrate the anniversary St. Petersburg, street performances for Czech Trade in London and the Czech Centre in Berlin. 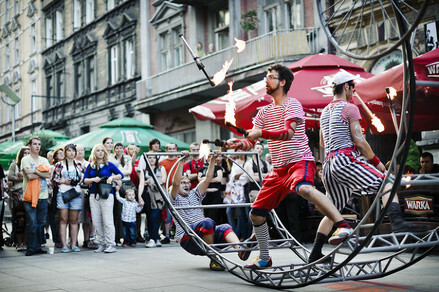 Pageant performance and large puppets, we have presented, among others, in Gdynia and Lviv. Our priority for this year is above all participation at the Expo in Shanghai and before it representation the City of Prague in Sarajevo. We work with many prestigious festivals and nonprofit organizations. Producer and holder of the brand V.O.S.A. is ART Prometheus, director is Jakub Vedral.